“. . . we can dance, we can dance, everything’s out of control,” went one of the verses, and while that song might have been more whimsical in its time, it may have foretold of our rather crazy times now, and of a new fashion fad as well. Because ever since Brexit passed – the referendum for Britain to leave the European Union and go back to being an independent country – a new fashion statement is identifying people with specific feelings about the current state of the world. 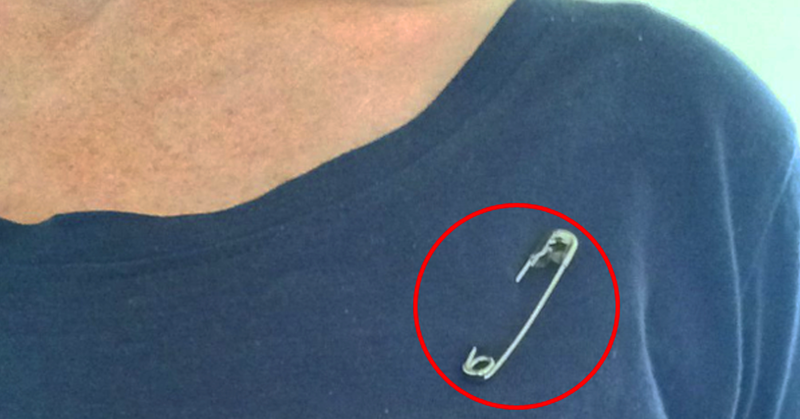 “I wear a safety pin to show that immigrants, refugees, and anyone else threatened by the hate and fear mongering of Trump and many of his supports [sic] can know that I care and will do all I can to combat xenophobia, racism, sexism, and ableism,” said one Instagram user after the election. Of course, just as many people are deriding the trend, saying it falls into what’s become known by the conservative media as the “snowflake” or “cupcake” syndrome, where people are so easily bruised and upset by everything all the time that they simply fall apart at the mention of almost anything. So much for trying to reach out: take your safety pin and stick it where the sun don’t shine, says the article’s author, who certainly appears to be a blond Caucasian man to the naked eye, but what do we know? Then there are those who see the safety pin as a more general statement about being safe, presumably as in for protection in a bad neighborhood, for example. We’re not sure how well a safety pin will hold up against a Glock or a Smith and Wesson pointed at your head, and wouldn’t be the first to recommend wearing one to stave off a mugging, either. Unless you are quick and poke your assailant in the eye with it before he does you any harm, that is. So, where does this leave the wearing of safety pins, exactly? And what if you just need one to hold together a shirt where a missing button fell off? Perhaps you’d better spend your lunch hour reading up on all the sub textual meanings, and don’t forget to tell babies who still wear cloth diapers held together by safety pins either, because they might get caught up in the wrong crowd and be misunderstood. Ah, modern life. Where are “Men Without Hats” when you need them?